Ever since I caught the audio bug, I’ve been intrigued by products that purport to cleanse, rehabilitate, regenerate—you name it—the electricity that powers your stereo. A few years ago, after extensively grounding my house electrical system and adding an Equitech isolation transformer and dedicated 20-amp lines for my stereo, I thought I’d gone about as far as you could to eliminate noise and hash riding on the power lines. It now turns out that I was quite wrong. Nordost’s Michael Taylor visited this somewhat skeptical reviewer, and the conversion process went rather quickly. Facts, as Thomas Gradgrind likes to say in Dickens’ Hard Times, are what boys and girls need. And in this instance, the cold hard fact is that the introduction of the Nordost QKore parallel grounding device into my stereo system jolted me out of a comfortable sense of complacency, replacing it with a sense of wonderment at just how much subliminal noise I had taken for granted. In a variety of small but significant ways, the QKore endowed my stereo with a sense of realism that almost defied credulity. Put bluntly, it is the most potent power product that I have experienced. Most power products have pluses and minuses. Some produce a greater sense of dynamics but suppress detail, or do the reverse. Others will produce their own noise through internal transformer hum. This is not the case with the QKore, partly, I think, because it is a passive product. Depending on how far you want to go, you can buy QKore 1, QKore 3, or QKore 6. As the numbers suggest, they allow you to ground increasing numbers of components. You plug a QKore wire, which is a monofilament that can be terminated with spade, male XLR/female XLR, BNC, banana, USB A, USB B, RJ45, or RCA into an unused input on your equipment, then run the wire into your QKore. This is supposed to provide the path of least resistance to ground for micro-potentials (voltages) that muck up your sound. 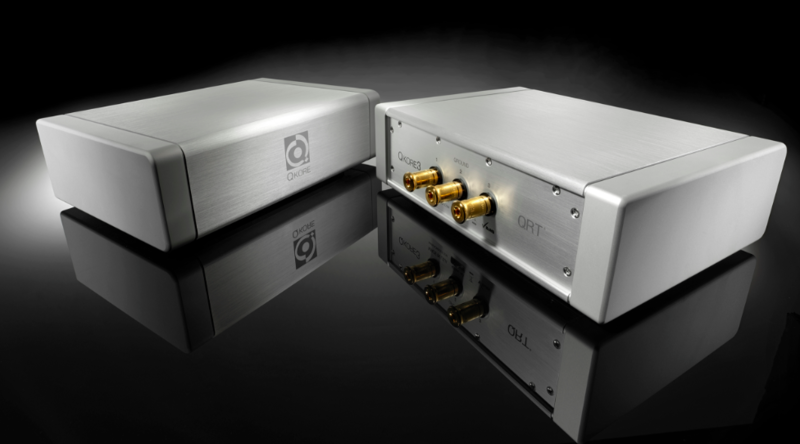 The QKore box itself contains, among other things, what Nordost terms a low-voltage attractor plate that includes a passive electrical circuit. I can testify that the QKore boxes made zero noise. In my system, I plugged the QKore in first to my dCS Vivaldi SACD/CD playback system, which consists of four separate boxes. There was an immediate drop in the noise floor. I heard an expansion both laterally and vertically in the scale of the soundstage. As I continued to plug in more front-end components, I continued to hear a variety of benefits. How do those benefits translate sonically? Take Javier Perianes’ riveting new recording of Schubert piano sonatas for Harmonia Mundi. The piano, particularly in the left hand, became much more powerful and audible, particularly in quiet passages. It might sound like a contradiction in terms to say that it became more powerful in the quiet passages, but what occurred is that notes in the bass region, even when struck gently, had a roundness and resonance and richness that was previously not apparent. This is another way of saying that timbral accuracy, both in the bass and treble regions, was improved. In allowing the music to sound more audibly in pianissimo passages, the QKore opened up the entire dynamic range. The fortissimo passages now sound more dramatic than they did before; powerhouse block chords struck on a grand piano didn’t fracture but remained centered, exploding with ferocity. Another ancillary benefit that the QKore conferred was to help increase the perceived density of the center image. This was particularly noticeable on orchestral recordings, where it helped to attenuate the sense of left and right speakers artificially playing in stereo as opposed to producing a coherent wall of sound. It’s not overstating matters, for example, to say that the QKore helped disentangle the reproduction of the chamber orchestra accompanying the lithe and nimble trumpeter Alison Balsom on her 2010 EMI Classics CD of Italian concertos. It was as though the various sections of the orchestras were no longer smudged together but could be heard clearly in their individual spaces. My surmise is that this is because of the greater fidelity of the micro-details that make up an individual note. The bowing of the violins and cellos was more solid, vivid, and precise with the QKore. The lower noise floor delivered by the QKore means that notes also trailed off into space, lingering for what seems like an eon, before disappearing entirely. This truly is a unit that helps to banish any sense of electronic haze or grain from the sound. Even bass was improved by the QKore. Bass, let’s face it, is probably the most difficult sonic region to produce faithfully. One of the most treacherous aspects, I think, is pitch stability in the nether areas. It’s easy to hear when a loudspeaker begins to compress or wobble on lower-octave notes. On some of my favorite Maurice André recordings on Erato of trumpet and organ, for instance, you simply hear greater air around the deep organ notes and more focused pitches. On Leonard Cohen’s final album You Want It Darker, the depth and refulgence and sonority of the bass adds immense dimensionality to the proceedings. But in the end it is the added refinement that the QKore provides that is most addictive. The more I listen, the more riveting I find the ability of a good stereo to capture the nuances of the music. Sure, the blockbuster stuff can be thrilling and will definitely impress your chums. But the elegance, the poignancy, the fragility of a musical line is what conveys the emotion at the heart of music. This is what the Nordost QKore does so well. I can’t help thinking that to achieve the most from any high-end stereo Nordost QKore is an essential product to consider. Price: QKore 1, $2499; QKore 3, $3499; Qkore 6, $4999; QKore wires, $360 for one meter and $150 per each additional meter; QBase 8 Mk.2 power strip, $1599.